We are often asked why our pinball machines cost more than the same machines listed elsewhere. And before you commit to buying a pinball machine, you need to know what to look for. 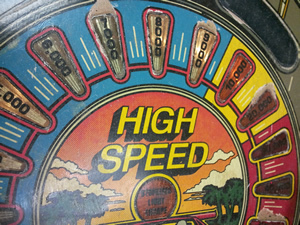 The more a pinball is played, the more the playfield surface is subject to wear. 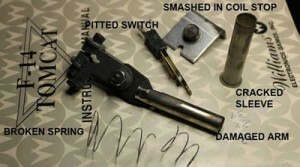 Light inserts suffer from high commercial usage and often become chipped and lose their original artwork. metal posts, which can damage the balls. playfield surface, stripping away the original artwork. Worn playfields lead to an uneven playing surface and affect the quality of gameplay and resale value of your pinball machine. High traffic areas also become worn overtime, which results in damage around light inserts. This type of wear is not repairable, there are some aftermarket stickers which can cover up the wear, but are not a great long term solution and will eventually lift and require replacing. This is why at Arcade Classics Australia, we hand pick our pinballs to ensure a playfield in clean collectable condition. 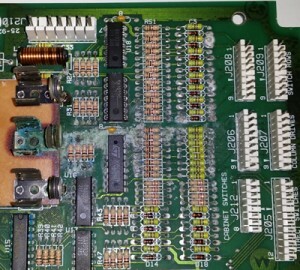 Corrosion to circuit boards is often unrepairable and leads to costly replacement parts. 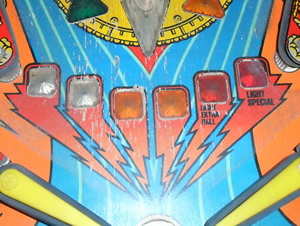 Pinball machines exposed to damp conditions and salt air can suffer from corrosion. 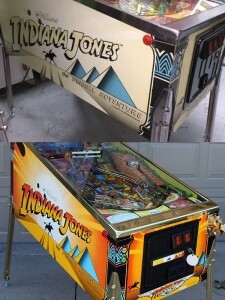 Not only will it seize up moving parts inside the machine, but also extends to the pinball machines electronics, meaning costly repairs to make the machine reliable to operate. Not only can your electronics suffer, but rusty steel components where the balls travel across will pick up these rust particles and grind them into your playfield, leading to discoloured playfields and premature wear. The difference between a sun faded pinball and new artwork is obvious. suffered fading overtime from exposure to sunlight. more than the cost of the artwork itself. The entire pinball machine must be stripped back to a bare shell, filled and sanded to remove any dents, chips and scratches before the process of laying the stickers can take place. This is why a pinball machine with brand new artwork can cost significally more than one with fade artwork. Worn flippers can keep working long after they are due for replacement, meaning loss of power and response. It is cheap any easy to call a pinball machine fully working, and leave old parts inside that will break down soon after. New flipper assemblies make your pinball play like new and will last for years. Pinball professionals know what parts wear out and need replacing and that is why we take the extra steps to supply a quality product that plays like it is supposed to. Remember that pinball machines are like cars, some have done low kms, others high kms, some have been regularly serviced by professionals and others not. The number one rule is you get what you pay for. At Arcade Classics Australia, we hand pick our pinballs to ensure relaiblity and quality.